West Platte’s Melanie Waters lays down a bunt attempt against East Buchanan on Wednesday, Oct. 10 in the first round of the Class 2 District 15 tournament held at Benner Park in Weston, Mo. 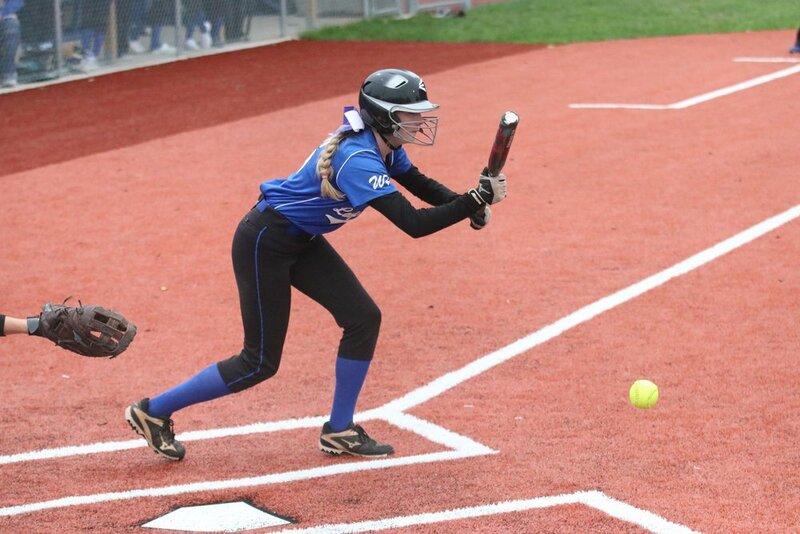 The softball season came to an end for North Platte and West Platte on Wednesday, Oct. 10 in the Class 2 District 15 tournament held at Benner Park in Weston. West Platte played first and dropped an 11-1 outcome to East Buchanan, the No. 4 seed, in a five-inning contest. Down 2-0 after an RBI triple, Jamie McPike blasted a two-run homer for the Bulldogs. A double play led to a run in the third inning and with Audrey Elifrits batting, an error on a stolen base led to the sixth run and she hit an RBI single to make it 7-0. The Bluejays (9-13) broke the shutout in the top of the fifth inning when Mallory Chambers hit an RBI groundout to score Lea Moose, who led off with a walk and moved up on Karah Dunham’s single. McPike hit a three-run homer and Elifrits doubled home the game-ending run in the bottom of the fifth with one out on the board. West Platte had four hits, two by Dunham, while Taylor McNair drew two walks. On the mound, Dunham fanned one in 4 1/3 innings of work. The Dragons needed only three innings to dispatch the Panthers in the late game on Wednesday, Oct. 10. Mid-Buchanan (18-7) got its first run in the first when Brylee Kemper reached on an error, scoring Ryleigh Frankum. The Dragons followed up with eight runs in the second inning, with RBI coming from Frankum, Kemper and Jaele Barber, who had a two-run single. Two sacrifice flies and an error made it 9-0. The Panthers (1-24) got on the board in the top of the third when McKenzie Sams hit a solo home run to center field, for what was the only hit on the night for North Platte. A seven-run third inning ended the contest early on the mercy rule, with started with RBI double by Kemper and ending with her RBI single. Mid-Buchanan lost to Lathrop in the semifinals, while East Buchanan fell to Plattsburg in the other semifinal. Lathrop won 1-0 against Plattsburg to win the district title.